The First Presidency wrote that the standards in For the Strength of Youth “will help you with the important choices you are making now and will yet make in the future.”1 With the release of a new edition of the pamphlet, Church magazines were able to spend a few moments with Young Women general president Elaine S. Dalton and Young Men general president David L. Beck talking about the revised pamphlet. Why a new edition of For the Strength of Youth now? Brother Beck: The Lord’s standards have not changed, but the adversary’s attacks against those standards have increased in frequency and intensity. For the Strength of Youth has been updated to help youth withstand these attacks. Sister Dalton: Prophets continue to speak in very clear terms to youth, and we want to keep their current words available. Youth need to be anchored in following the prophet, so recent teachings have been integrated into this pamphlet. Brother Beck: As President Thomas S. Monson has reminded us, today’s youth are growing up in a time when the gap between the Lord’s standards and the world’s standards is widening.2 Temptations are becoming stronger, and sinful behavior is becoming more socially acceptable. The inspired counsel in this new pamphlet is an indication of Heavenly Father’s love for the youth. He wants each young person to enjoy the blessings of living the gospel and has given them standards to help them. He has an important work for them to do now. The standards in For the Strength of Youth help qualify them to perform His work. What has been updated with this edition? Sister Dalton: “Work and Self-Reliance” has been added. A lot of youth are spending so much time with new technologies﻿—social networking, Internet browsing, video gaming﻿—that they never really learn how to work. That’s a concern because when a young person goes on a mission, sometimes he or she isn’t prepared for the rigors of that hard physical and spiritual labor. This goes along well with another new section: “Physical and Emotional Health.” You need to be physically healthy and take care of your body, but you also need to be mindful of your emotional health. Brother Beck: Additional emphasis has also been placed on following the Spirit and living worthy to attend the temple. How can youth make For the Strength of Youth a part of their lives? Sister Dalton: I’d like for them to look for the blessings mentioned in the pamphlet and think about how these blessings will lead them to their goals. I really believe this generation is preparing the earth for the Savior’s Second Coming. I would urge youth to remember that they want to stand with confidence in His presence when He comes again. 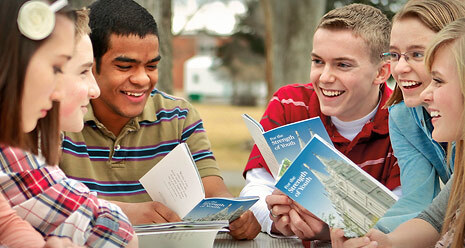 Brother Beck: The Fulfilling My Duty to God and Young Women Personal Progress booklets also offer several good ideas. For example, in the “Live Worthily” sections of Duty to God, young men are invited to study the standards in For the Strength of Youth, make a plan to live by them, and then share their experiences with others. By doing so, they strengthen not only their own testimonies, but they also strengthen others. Sister Dalton: Another interesting exercise would be for the youth to go through For the Strength of Youth and circle all mentions of the Spirit. Living these standards will enable them to have the constant companionship of the Holy Ghost. And in a time when youth are making critical decisions in their lives, they need that companionship. Brother Beck: I also see the pamphlet as a great resource for sharing the gospel; we can use it to help our friends understand why we live the way we do. Youth could also use it to prepare family home evening lessons, sacrament meeting talks, or lessons for Church classes﻿—or even just to find answers to questions about the Lord’s standards. As youth do these things, the doctrines and principles in For the Strength of Youth will go deep into their hearts and become a part of who they are. What would you say to those who think it’s hard to keep these standards in today’s world? Sister Dalton: I’d say, “You’re right; it is hard.” But I would remind them that it’s a lot harder when you don’t keep the standards. Sin complicates your life and leads you to deal with things that you don’t want. I would say that living the standards in For the Strength of Youth is a key to happiness, and everyone wants to be happy. Brother Beck: Nothing this world has to offer can compare to the comforting influence of the Holy Ghost, to the satisfaction of knowing that Heavenly Father is pleased with you, or to the power of temple covenants. These are the blessings promised to those who obey the Lord’s standards. What advice would you give to youth who don’t receive a lot of support at home in living these standards? Brother Beck: I believe the Lord places each of us where we can do the most good with the spiritual gifts He has given us. If your family doesn’t share your commitment to living the Lord’s standards, don’t give up. Keep living the way you know you should, because you never know who in your family might be watching you and privately drawing strength from your example. Sister Dalton: Also, always remember who you are. You were reserved to be on the earth now because you have a strong testimony of the Savior. You proved that in the premortal world. As Brother Beck mentioned, your living the standards might ultimately bless your family. Don’t compromise. Don’t give in. As we live these standards, we can be a light. We can reflect the Savior’s light. What blessings will come to youth as they live the standards? Brother Beck: The Lord has promised many wonderful blessings to those who are true to the standards He has set. Some are immediate: the companionship of the Holy Ghost, peace of conscience, and increased faith and confidence. Each time we obey a commandment, our ability to obey grows. Sister Dalton: The world says, “Try everything. Because you’re young now, you can experiment.” What happens when you follow that message is like a funnel that starts out wide but gets pretty narrow at the bottom. Your agency becomes restricted by those decisions. Experimentation can lead to addiction. A moment of excitement can lead to pregnancy out of wedlock or a change in your life plan. But if you will walk a strict path﻿—turn the funnel upside down﻿—and obey the Lord’s standards, the whole world opens up for you and grows wider as you keep the commandments. Instead of being bound to your mistakes, you have the freedom to live the kind of life that will make you happy. Brother Beck: The world needs young people who understand the value of these blessings and how to qualify for them. There are many among your friends and your peers who are looking for an alternative to the world’s ways, who want true principles to build their lives upon. All they need is your example and testimony. Would you like to share anything else with the youth? Sister Dalton: The message I would give to the youth is that repentance is not a bad thing; it’s a blessing. The Savior provided for us the ability to repent. Don’t wait. We can change, and that will help us live the standards. One virtuous young man or young woman led by the Spirit can change the world. You can be that one. Brother Beck: We love you, and we rejoice in your goodness. It’s exciting and inspiring for us to witness your faithfulness. If you feel alone, remember that there are thousands of youth just like you around the world who are committed to keeping the Lord’s standards. Remember also that the Holy Ghost can be your constant companion. Live worthy of His presence, follow His promptings, and allow Him to comfort you when you need it. Heavenly Father loves you and trusts you. He has great things in store for you. For the Strength of Youth (booklet, 2011), ii. See Thomas S. Monson, “Dare to Stand Alone,” Liahona and Ensign, Nov. 2011, 60. How Can I Explain to My Friends Why Our Standards Aren’t Restrictive? You can use the funnel analogy Sister Dalton mentions. Trying things the world suggests will narrow your future because of the negative consequences. We turn the funnel the opposite way, where following standards and commandments opens up lots of opportunities for us now and in the future. Have the companionship of the Holy Ghost, especially in making important choices. Enjoy happiness and freedom rather than enduring consequences of addiction or sin. Be worthy of temple blessings and eternal life, which is our ultimate goal. Right: Christ’s Image, by Heinrich Hofmann, courtesy of C. Harrison Conroy Co.